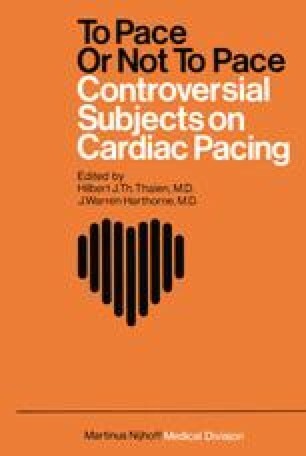 With introduction of the transvenous electrodes and implantable units in the early sixties and with rapid development of artificial cardiac pacing, a new period started in pacemaker therapy which appeared to be one of the most efficient methods of treatment in clinical practice. Now it is quite impossible to create a cardiological department or coronary care unit without a pacemaker section. We are still of the opinion that permanent pacing should be performed only in the experienced centers which have the ability to perform at least 50-100 new implants per year. Some years ago mostly surgeons have been dealing with pacemaker treatment. Now it spreads to the cardiologists but the teamwork is necessary for efficient results and for avoiding as much as possible the percentage of complications, errors and difficulties. Only the cooperative efforts and the application of the latest fmdings can provide the patient with optimal aid, thus leading to a considerable improvement in therapeutic possibilities.